Peugeot will launch the Partner Tepee Electric at the Geneva Motor Show 2017. The all-electric MPV should reach UK showrooms by the summer and be capable of travelling over 100 miles on a single battery charge. 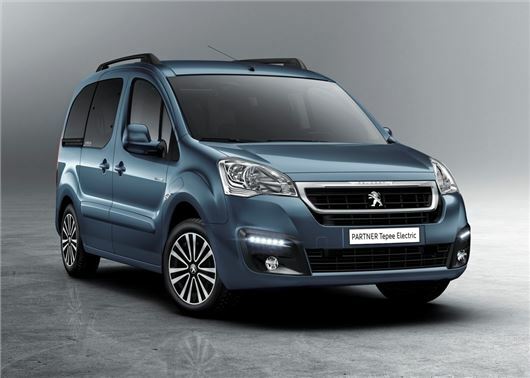 Based on the aging but popular French van, the Peugeot Partner Tepee Electric MPV will seat up to five adults across two rows and boast zero tailpipe emissions, which means it will qualify for zero VED under the new 2017 road tax rules. Peugeot hasn’t released any battery details – such as maximum range or charging times – but it is promising 100+ miles from a single charge and hassle free maintenance, with the battery covered by an eight year/60,000 mile warranty. Both charging and air conditioning can be remotely controlled via a smartphone app or tablet computer, which means the driver will be able to heat the car remotely and program the charger so that it replenishes the battery overnight when the electricity tariffs are cheaper. Despite the electric powertrain and battery, the Partner Tepee’s boot space remains unchanged. This means luggage capacity will be 1350 litres, with five passengers aboard, or a whopping 3000 litres with the rear seats folded. The rear seats can also be removed to return the vehicle to its original van-like state and provide a completely flat load area.